If you take a look at the above image you can play a little game and see if you can spot three ibexes hanging out on the hill. Maybe this is really easy, I’ve looked at this picture enough times that they don’t seem camouflaged anymore so I really don’t know. 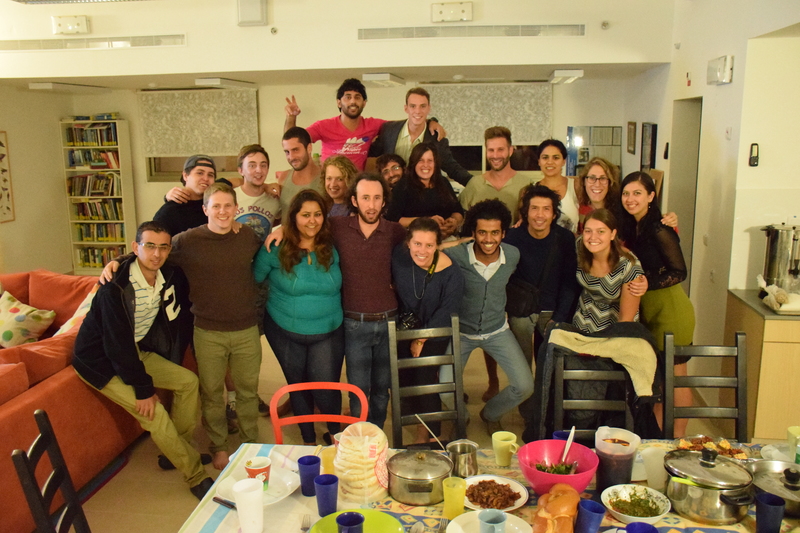 One day we all decided to have a potluck instead of going to shabbat dinner on Friday night. It was somewhat spontaneous: some of us had been planning it all week, some of us didn’t join in until the day of, but no matter what we had a lot of food and a lot of people. I had gone shopping in Eilat that morning so, thinking ahead, I had purchased the ingredients to make chicken and rice. I was going to make crepes, but after I managed to find both white pepper and garlic salt I realized this was fate telling me something. It was a super fun potluck and for some reason the garlic salt and white pepper were nothing like what I have at home so the sauce I created ended up being a lot closer to alfredo sauce than usual (which meant that I used the other chicken breast to make myself chicken fettuccine alfredo for a late lunch yesterday and it was excellent). After the potluck I went with a small group over to Kibbutz Lotan, another kibbutz just up the road from us. They are rather famous (in the area) for their mud building and we were going to hear a lecture on EcoVillages. In the end, the lecture was actually about a networking group that helps people create EcoVillages, and EcoVillage is one of those misleading terms people use to make things sound greener. Although being environmentally friendly is a nice addition with EcoVillages, the point is that they are sustainable economically. Kibbutz Lotan was very cool though, below is a picture of one of their mud sculptures. Across the way from the igloo was a mud car with ladybugs painted all over it, but this seems to be more seasonally appropriate. The whole area was a sort of play area for kids with mud turtles to climb on, little mud tables to sit at and even a mud slide. One of Lotan’s tourist attractions is their tour of their sustainable set up, which includes all of their mud building projects, composting toilet etc. 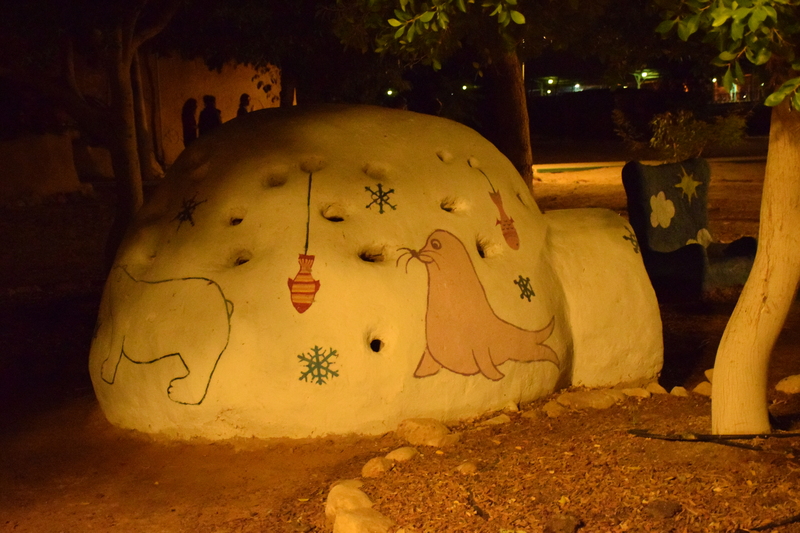 They also offer mud building workshops to people for 300 shekels (~$85) to learn how to create their own mud buildings. I haven’t been talking about hiking enough, I don’t want y’all to get the impression that I spend my days doing things other than hiking so I’ve got some fun stories from my last couple hikes. 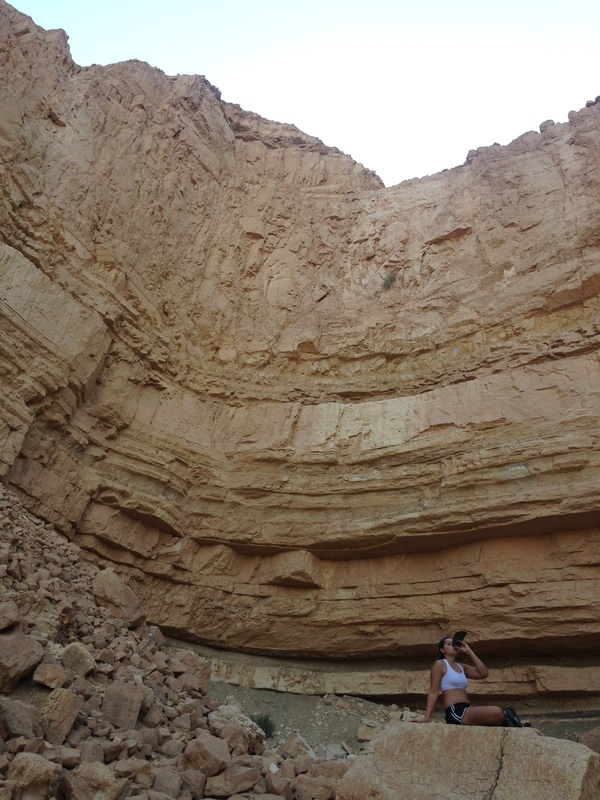 This wall was a cool find of a friend and myself when we explored one of the wadis branching off the Red Road. 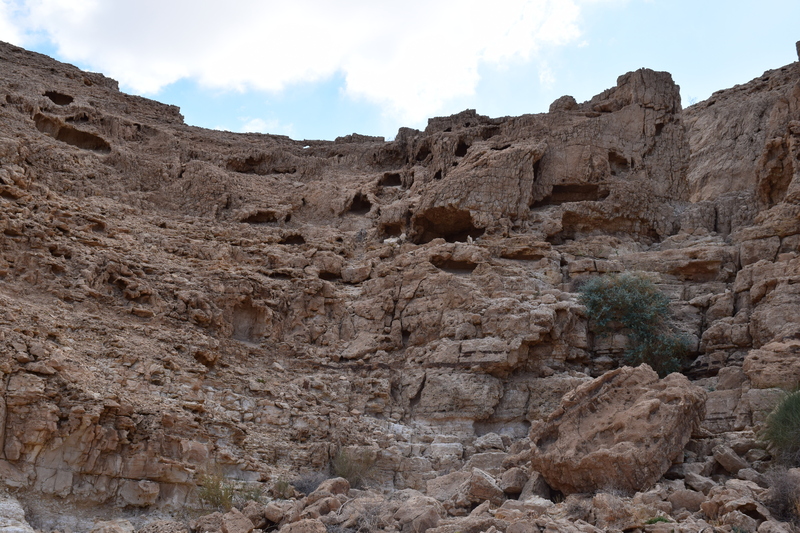 All the little holes on the wall are actually quite big, most were large enough for us to fit in and made great hidey-holes for me (or more likely for ibex). It’s a little hard to see but this was probably about three stories tall and at the top had two wall walls with a break in the middle. We started calling it the entrance to Helm’s Deep. Unfortunately, sun and the shadows meant that I couldn’t even get close to getting a good picture of it. From what we could tell this was an old army training post, I found a soldier’s dog tag in the rocks and when I was walking around spotting a bullet lying on the ground.Up at the top of one of the hills was a small rock shelter with, what was a bunch of sandbags around the edges. My friend’s guess was that someone could lie up there and practice shooting a sniper. 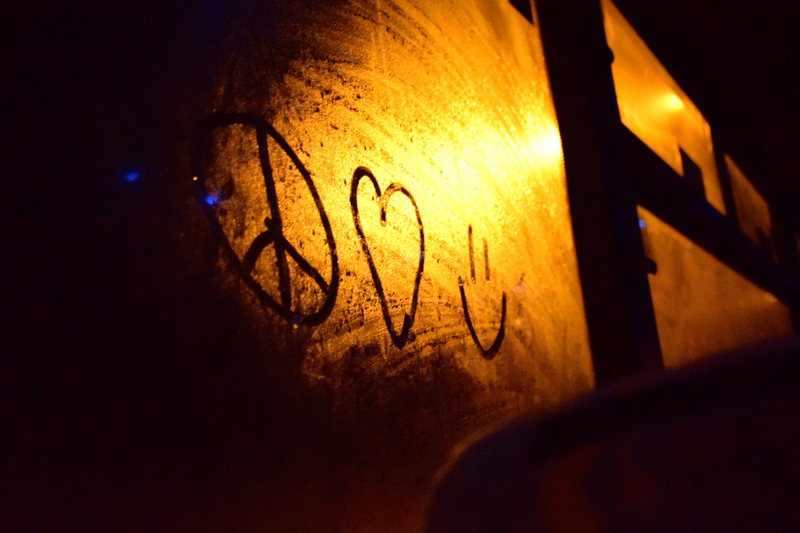 Similar to the Negev Trip, each semester students embark on a PELS (Peace-building and Environmental Leadership Seminar) trip to Jerusalem/Tel Aviv to learn about the conflict. This was almost exactly like the trip I took last year with the Olive Tree Initiative, just shorter. But we did have a couple of the same stops: Yad Vashem, a meeting with The Parent’s Circle. 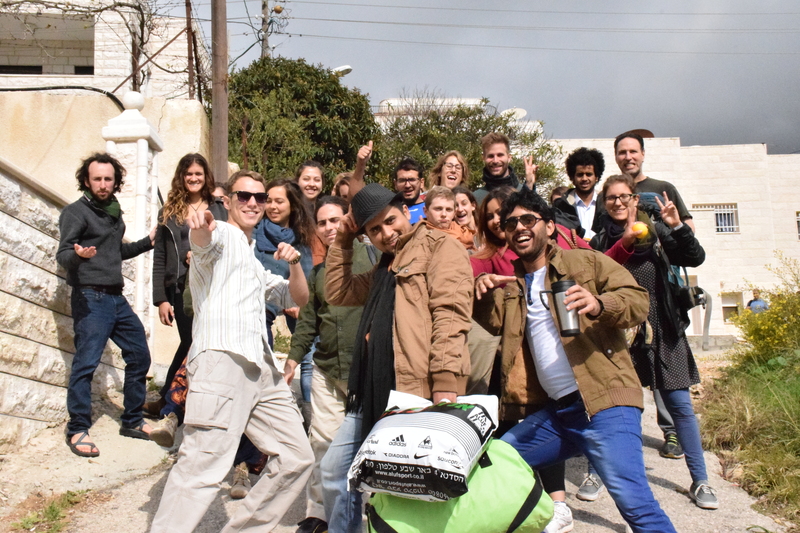 Below is a picture of the group embarking out on our adventure into Abu Ghosh, a mixed arab/jewish village on the outskirts of Jerusalem (as the photographer, I’m not in the shot, but it’s a pretty epic shot even without me in it :D). In Abu Ghosh we stopped at a mosque, in the downstairs area we met with the Parent’s Circle, and then toured the mosque upstairs afterwards. Apparently it’s the largest mosque in Israel, it was funded by the Chechens and some of the decoration is inspired by the turks. 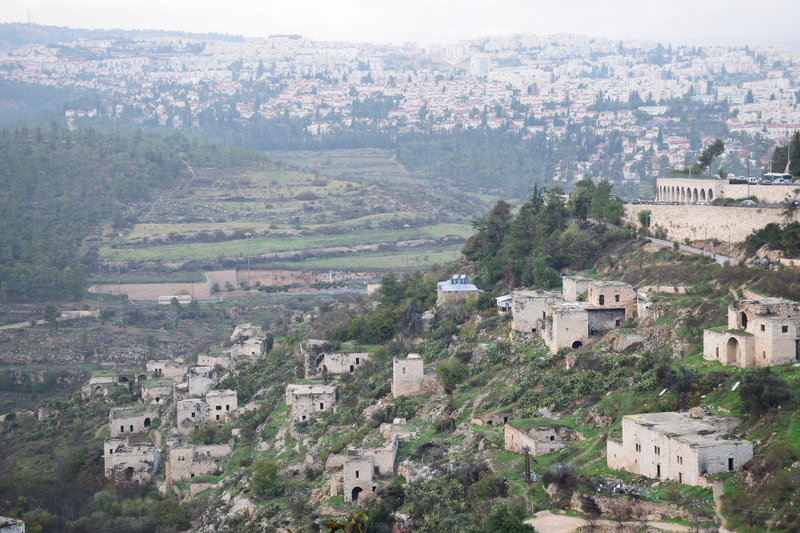 We also visited the abandoned village of Lifta on the outskirts of Jerusalem. The folks who lived here left/were driven out during the 1948 war and the town has remained abandoned since. We were there at sunset so we didn’t have a lot of time to explore which was a shame because it was a beautiful place and I would have loved to look around and walk between the houses. This hike actually happened before any of the above occurred, but the photo was taken on my phone so it was slightly overlooked. This is the cavern at the end of crystal canyon. In case me at the bottom isn’t enough to really give you a sense of scale, this is easily 50 feet tall. I’m not sitting at the base of it, I’m not anywhere near the base of it, that’s just a nice place to sit. It’s a very cool place to hang out, it echoes very nicely and if you want to have some fun with a friend, because it’s concave, you can stand at either end of the round parts and whisper to each other from like fifty feet away. Yay science! Lots of hiking wouldn’t normally destroy my hiking shoes as the paths in the US are generally through forests and over dirt. 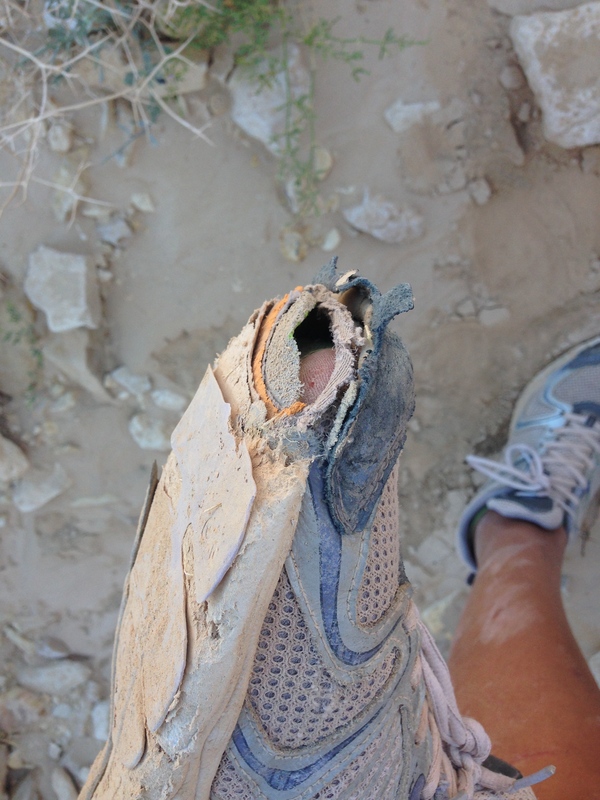 But the desert is not a forgiving place and spending two and a half months hiking over sharp rocks has finally led to the end of my hiking shoes. I’ll admit I was in denial of this and I took them on one last hike and managed to create and even larger hole in the shoe, which led to a hole in my sock (hence the picture below), which led to me getting stabbed repeatedly when I forgot there was a hole and stepped on spiky plants. That was my shoes’ last hike and while I was heading back to the kibbutz, I was inspired to create and ode to my shoes which brought me so far*. And speaking of overlooked photos! This one’s not the best since it was taken on my phone, in a hurry, with crappy lighting etc. etc. BUT! 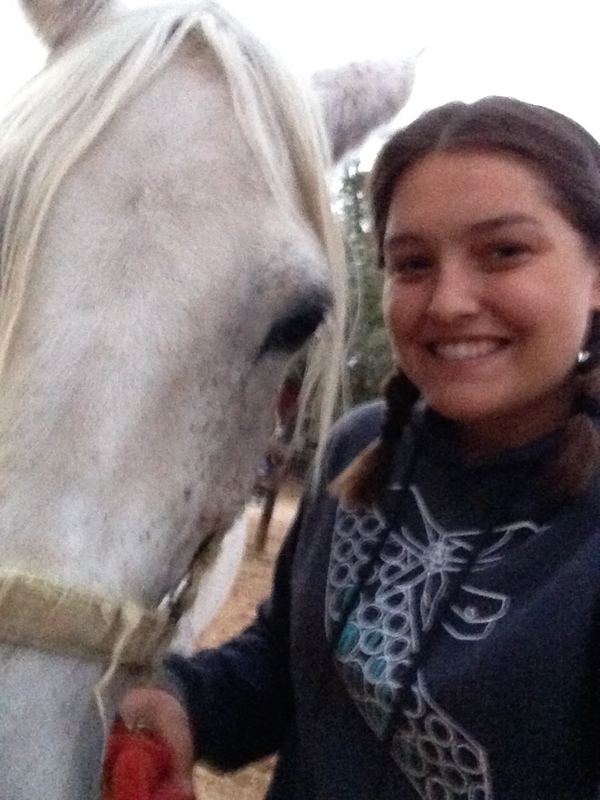 Thanksgiving isn’t actually a holiday here, and although we have a potluck planned we postponed it until students come back (a lot left for the weekend to go home/adventure) so I spent Thanksgiving horseback riding, which is kind of the best way to spend it. #datkibbutzlyfe: A week or so ago, one of the other students was hanging out with the gharin on the kibbutz (essentially folks waiting to go the army or folks who just finished their army service) and they told him about a music room in one of the bomb shelters on the kibbutz. He went and checked it out and then came and found me, assuming that I would like this just as much as he did. As I mentioned before, it’s a rather incredible little room in the bottom of the bomb shelter, but what was even more interesting is how unused it seems to be. There’s a blackboard on the wall, a couch at one end and music stands strewn throughout the room. The room has a nice rug on it and there’s a cupboard full of reeds for various different instruments. Curious about the nature of the music room, we questioned some of the kibbutnicks. For the most part, they told us that there’s a band on the kibbutz that uses it for a practice space but otherwise it doesn’t get used much. They also mentioned that there’s a drum set down there but not much else, so we should bring our own instruments. There’s actually far more than a drum set down there including tons of old sheet music; the adults responses more than anything told us how unused the music room is. I’ve been using the sheet music to reteach myself piano; there are some excellent beginner piano books down there. The only bummer is that it’s all really old, so there aren’t many modern songs to play. I can’t really explain how much I love the music room. It’s just one of those things that you either feel, or you don’t. For me, the music room is my Terabithia**. #datkibbutzlyfe: One of the women who lives at Lotan also works at the institute (she does some PR stuff and I send her a batch of my photos every few weeks just in case she needs them for something or other) so she told us a little bit about Lotan as a kibbutz. This is one of the kibbutzim that is becoming more privatized due to economic need. The example she gave me was that they’re starting to introduce pay grades (with a very small margin) but said things like the dining commons and laundry would remain communal. They’re also one of the smallest kibbutzim in the area with only 150 people total, Ketura for comparison has 150 kids. On the religious axis, Lotan is made up of a very progressive group of jews who are much more relaxed about things like using electricity on shabbat. Unlike Ketura, which is a mix of secular and nonsecular and defaults to nonsecular traditions, Lotan is fully made up of these progressive jews types. I don’t really know what that means other than they’re more lax about shabbat which is why I’m doing a rather shoddy job of explaining it. 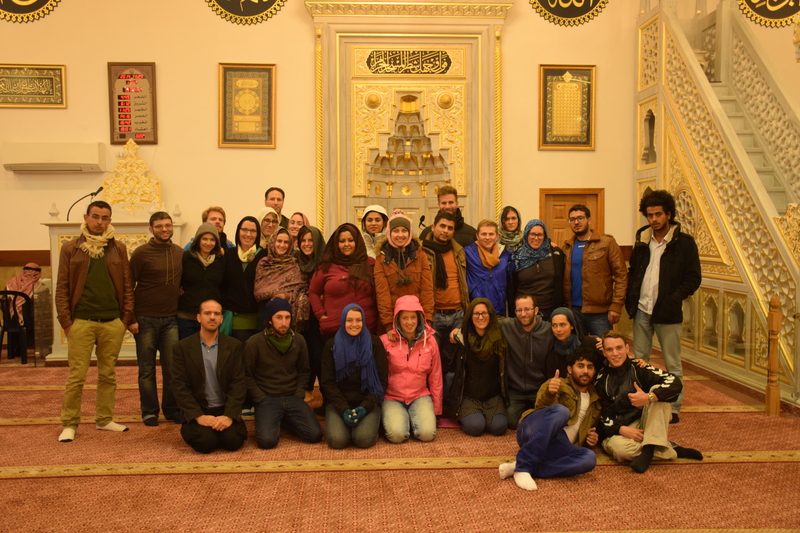 #datkibbutzlyfe: Regarding giving myself a hijab for the tour of the mosque in Abu Ghosh: I wrapped my scarf around my head like a hijab before we headed into the meeting with the Parent’s Circle (I thought we were doing the mosque first, in which they insist women have their heads covered) and immediately all of the muslim students told me that I looked beautiful. Even one of the facilitators told me “You don’t have to, [referring to the fact that we weren’t going into the mosque yet] but you do look beautiful.” I totally wasn’t expecting that kind of response and I found it rather fascinating. **If you don’t know what Terabithia is, I recommend you read Bridge to Terabithia, it’s a pretty easy read meant for kids in elementary school. It was turned into a movie recently and, although it’s a good rendition, it doesn’t actually capture how awesome Terabithia is.